Holy Crap, is a modern expression often used for when you are surprised, impressed, or disturbed by something. Some examples may include finding 5 Dollars in your back pocket, listening to a priest fart at mass, or seeing a snake eat a crocodile. But today I have found the most Proper situation to use the expression: "Holy Crap!" 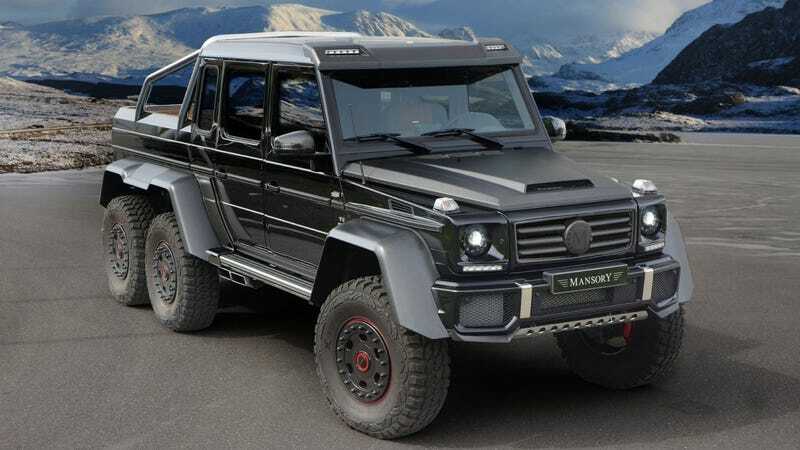 That is, the Mercedes Benz G-Wagen 6X6 AMG Tuned by Tuning Company Mansory. This leviathan of a thing has not 700, or 750 Horsepower. But an astonishing 828 coming from its 5.5 Litre Twin Turbo-charged and heavily modified V8 Engine. Damn. Torque is electronically limited to 737 lb.-ft. Top Gear just made a review of the Brabus 6X6 with less HP and did the 0-60 run in 4.4 Seconds. So this will probably hit 0-60 in the 4 second range, beating 911s, F-Types, Corvettes, and fight hand on hand with Ferraris and Mc Larens. Oh, yeah, while still weighing in at 3775kg. There is also the usual Mansory interior appointments, which is to say, interesting. Not my cup of tea if Im honest. But for the gazillionares that don't dare want to be seen driving the same car as their oil-beneffited neighbour who has the Brabus tuned one this is their time. Its as easy as writing a check for roughly $600,000 Dollars, which has to be the size of a refrigerator, just to keep the massive theme going on.